Anyway, what caught my eye was a particularly poor piece of typography and design. Check out the picture here and see if you made the same mistake that I made - "Fairly ethically traded". "Fairly ethical"?! What does that mean? Do they only rip off the coffee growers a little bit, or do they only rip off every second farmer in Ethiopia? 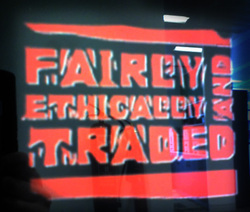 Of course, taking a closer look, the logo actually says, "Fairly and ethically traded", which isn't so bad. But, did no-one else in the client/designer/manufacturer chain notice what I and every single person I've shown this to noticed? The news is buzzing today with talk of the British Mediterranean Airways "ghost flights" from London Heathrow to Cardiff. The Sunday Times yesterday revealed that the airline, a British Airways franchise, has been flying two empty Airbus flights per day since October last year in order to keep the Heathrow landing slots they would have otherwise lost when their service to Tashkent in Uzbekistan was cancelled. In doing so, each trip has pumped 5.21 tons of carbon dioxide into the atmosphere. Landing slots at Heathrow are highly sought after and are known to be worth up to £10 million. The landing slot policy, in which 80% of its allocation must be used in a six month period is known as "Use it or Lose it". Only short-terms exemptions are permitted. BUILDER: Has Mr. Dent come to his senses yet? FORD: And can we also assume that he’s going to be staying here all day? FORD: So all your men are going to be standing around all day, doing nothing. FORD: Well, if you’re resigned to doing that anyway, you don’t actually need him to lie here all the time, do you? FORD: (patiently) You don’t actually need him here. FORD: So, if you would just like to take it that he’s actually here, then he and I could slip off down to the pub for half an hour. How does that sound? FORD: And no sneaky knocking down Mr. Dent’s house while he’s away, all right? BUILDER: (deviously) The thought hadn’t even begun to speculate about the merest possibility of crossing my mind! Could British Mediterranean Airways and Heathrow Airport not have come to a similar arrangement? You may have seen the holamun2 video (below) in the last couple of weeks about how Mexicans may starve because corn is now being used to make ethanol as a gasoline additive/replacement, instead of being used to make corn tortillas, a food staple, particularly for the poor. So, we use up fossil fuel to create corn, to turn into ethanol, which we can then pretend is a green fuel. When are we going to stop looking for replacement carbon-based fuel to burn, and just cut down our energy use? As I've discussed before, I'm a big air traveller. Until I decided to become Carbon Neutral, I'd always stressed about how I'm contributing to Global Warming. I know I'm not unique here but what can the average traveller do, frequent or infrequent, who share these concerns? Millions of people book flights online these days, particularly on the budget carriers like easyJet and RyanAir. When booking flights online, we're used to the additional costs that get added such as additional baggage, as well as the other optional services like insurance, car hire and hotel rooms. So, why can't another item be added - CO2 offset. This optional cost would be very easy to calculate and per individual would be very small - at best 1% of the flight cost. After spending Christmas in New York and Florida, flown to Scotland and back this weekend for my sister's wedding party and having already booked my next New York trip in April, I've decided that I can't continue to obsess about the environment when my carbon footprint is as big as the Jolly (not so) Green Giant. My wife discovered a website called Carbonfund.org that enables you calculate how much CO2 you're responsible for and offset it by supporting renewable energy, energy efficiency and reforestation projects. The cost for my not inconsiderable contribution to polluting the upper atmosphere this year: £60. Considering my average yearly travel will at least include 3 or 4 returns to New York, a return to the US west coast, a trip to Eastern Canada and a good half dozen return trips within the UK and Europe I think that £60 is a small amount to pay to help lift the guilt from my shoulders, as well as make up for my part in Global Warming. So, when British Prime Minister Tony Blair last week responded to a call to cut down his international travel as "impractical", it really was a missed opportunity. Blair went on to say, "I personally think these things are a bit impractical actually to expect people to do that...It's like telling people you shouldn't drive anywhere". If the Prime Minister was serious about environmental issues, he should have, like Conservative Leader David Cameron, long ago started off-setting his personal travel. It wouldn't have cost much, it would have been marvellous (much needed) PR for him and more importantly it would have provided opportunities to promote carbon neutrality scheme, which would have been expanding upon at great length by our hungry media who have hours of airtime, acres of newsprint and millions of pixels to fill. Instead, a Number 10 spokesman later said that Mr Blair WILL offset emissions from his holiday flights - a begrudged, face-saving gesture from a spin doctor. However, the Prime Minister's own website records that he only offset himself and not the other 4 members of his family, "Asked to clarify whether the Prime Minister was offsetting his own travel, or that of the whole family, the Prime Minister's Official Spokesman (PMOS) said that it was his personal travel, but the PMOS was not going to get involved further". The British Government has a plan in place to be carbon neutral, but not until 2012. As a frequent business traveller the Prime Minister could have, as a result of this publicity, led the way in encouraging individuals and businesses alike to take personal responsibility for their carbon footprint. Sadly, our Prime Minsiter has revealed that his environmental credentials don't stand up to scrutiny. “Out of 925 recent articles in peer reviewed scientific journals about global warming, there is no disagreement. Zero." "Since the 1990s, 57% of articles in newspapers and magazines press question the evidence of global warming." 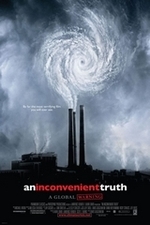 So Al Gore enlightened us in "An Inconvenient Truth". There's no ambiguity there. The issue of Global Warming is being repositioned to the public as a debate, through the PR of corporations with vested interests. Yesterday, Chrysler's chief economist Van Jolissaint attacked European attitudes to global warming, describing climate change as "way, way in the future, with a high degree of uncertainty". "Europe seems to take a political position that some people might describe, not me of course, that some people might describe as quasi-hysterical, that the sky is falling." "We think they should deal with it in a step-by-step, rational way and not play much Chicken Little." BBC Online reported that Mr Jolissaint was speaking at a private breakfast at the Detroit Motor Show where the chief economists of the "Big Three" US car firms presented their forecasts for auto industry sales this year. Most of the audience - which was mainly made up of parts suppliers - apparently nodded in agreement with Mr Jolissaint. ps It's Chicken Lickin Mr Jolissaint, not Chicken Little. Chicken Little doesn't rhyme. It's Henny Penny, Foxy Loxy, Cocky Locky, Turkey Lurkey, Loosey Goosey, Holey Moley and Chicken Licken. The $100 laptop is almost ready to ship, with Brazil, Argentina, Uruguay, Nigeria, Libya, Pakistan and Thailand all set to be receiving them this summer. Since it's inception, may people have said, "I'd like a $100 laptop too", but the concept is for children in the Third World to benefit from the Linux-based machine. 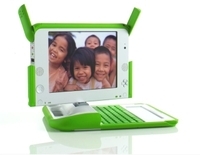 However, Nicholas Negroponte, chairman and founder of the One Laptop Per Child (OLPC) group has come up with a novel marketing plan to enable people to buy one: buy two, get one: buy two, get one - you get one, and a child in the developing world gets one. 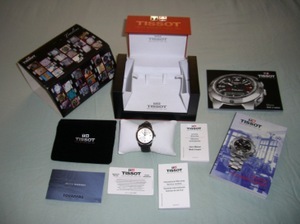 The buyer will then get the email address of the recipient child that they have effectively sponsored. Google will be providing tools to enable the children to publish on the Web. With corporations lining up to exploit Third World countries as a new source of cheap labour, I get a kick out of the notion of an African child saying to Nike, "no thanks, I don't need your sweat-shop job, I'm a web designer". Yesterday, an excited rumour started spreading in the science community (and quickly the web community) that NASA was about to confirm an astonishing discovery on Mars. And boy they didn't disappoint. The best evidence yet of flowing water has been discovered on Mars. Not frozen stuff on the polar caps, not frozen deposits deep underground, but flowing surface water. NASA showed comparative photographs from 1999 and 2005 taken by the Mars Global Surveyor that suggest water carried sediment through them sometime during the past seven years. "The shapes of these deposits are what you would expect to see if the material were carried by flowing water," said Michael Malin of Malin Space Science Systems, San Diego. "They have finger-like branches at the downhill end and easily diverted around small obstacles." Sadly, the Mars Global Surveyor has not communicated with Earth since November 2, suggesting that it's suffered a power failure. Both the Mars Reconnaissance Orbiter and the Opportunity Rover have been unable to contact it either.